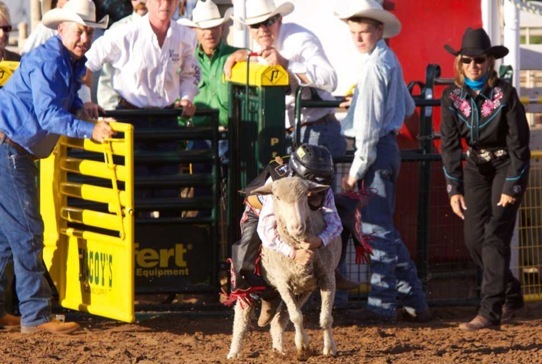 The 80th Annual Coleman PRCA Rodeo will be hosting Kid's Mutton Bustin'. Mutton Bustin' has become a popular addition to Rodeo Performances and is similar to the Grown-up Cowboy rough stock except that the youngsters will ride SHEEP. Contestants are selected from a random drawing and must weigh 55 pounds or less to be eligible. Fifteen contestants compete each night of the rodeo prior to rodeo performance. Each child will receive an official Mutton Bustin' T-shirt for participating. The T-shirts are donated by Coleman County Special Utility District and the award is sponsored by Jimbre Ranch. The contestant with the highest marked score each night will receive a Champion Belt Buckle. Belt Buckles are donated by Coleman Rotary Club. Click here for the Mutton Bustin' Form.